Galettes are such an amazing food. Like a tart or a pizza, only much more elegant and easier to make. This dough came out so beautifully, with a buttery flakiness that could be eaten all on its own. There is a very good chance that this Fall will be filled with galettes, sweet and savory. In a food processor, combine 1 1/3 cup flour, salt, sugar and butter, process until well combined. Add the remaining flour and process again until combined. Transfer to a bowl and add the water with a wooden spoon (don’t add the water while the dough is in the food processor or your dough will be brittle and cracker-like). If the dough isn’t moist enough, you can add more water, a tsp at a time until the consistency is right. Form dough into a disk, wrap with plastic wrap and chill in the refrigerator for 2 hours. Once the dough is chilled, roll into a “rustic” circle. The great thing about a Galette is that an odd shape looks charming, don’t worry about making it too perfect. 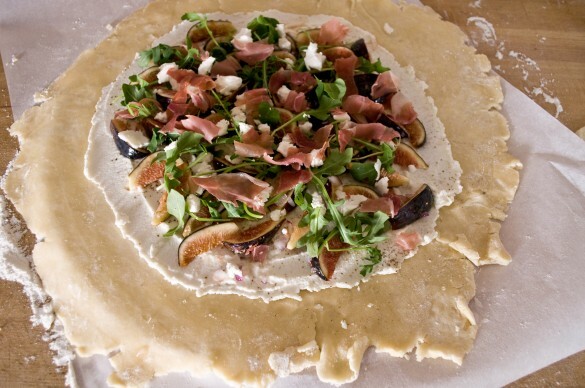 Transfer to a baking sheet or a pizza stone covered with parchment paper. Spread the ricotta in the middle, leaving about 2-3 inches on all sides bare. Top with salt and pepper. In a bowl, combine the figs, honey and onions, toss to coat. Add the figs to the top of the ricotta, then add the arugula, goat cheese and prosciutto. Brush the crust with melted butter and bake at 375 for 40-45 minutes or until golden brown. I added additional arugula and goat cheese to the top before serving, but this is completely optional. This is my kind of combo!! I see galette recipes everywhere! I think it’s time I try it! I have been wondering when fig season starts. I am ready to use some of those in baking! Goat cheese and figs are delicious together. The way you described that crust is making me hungry for this. Yum! I have been wanting to make something like this! 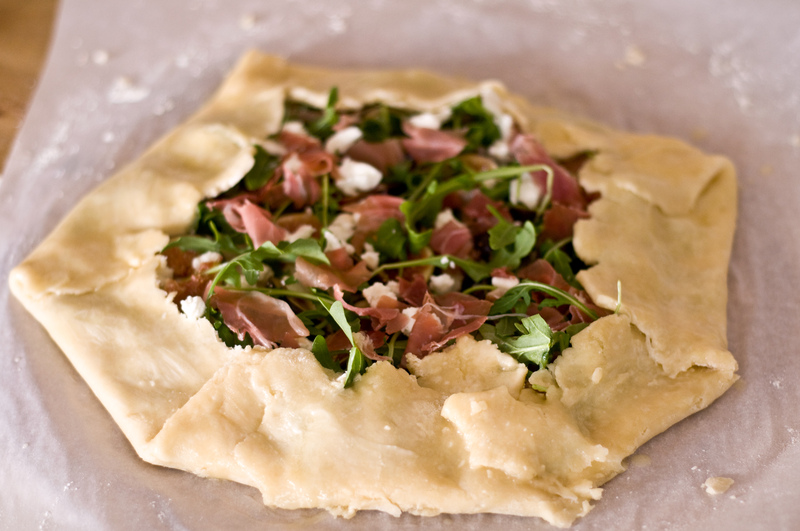 Just waiting for the right occasion… Your crust looks so nice and flaky and light! YUM! Yum!! 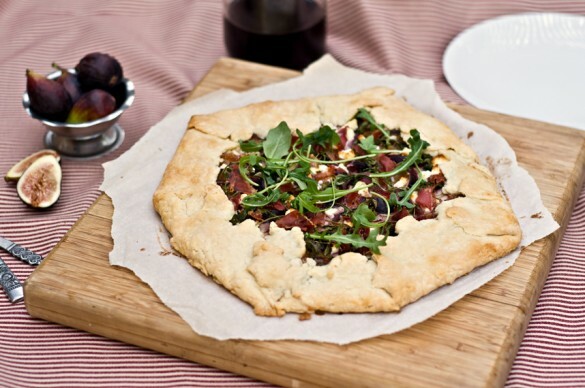 This galette looks fabulous! I love goat cheese and figs!! Ever since I made this (and consumed nearly the entire thing in one sitting) I can’t stop thinking about figs and goat cheese! Thanks! You shouldn’t be intimidated, SO easy! Wow! This looks amazing. 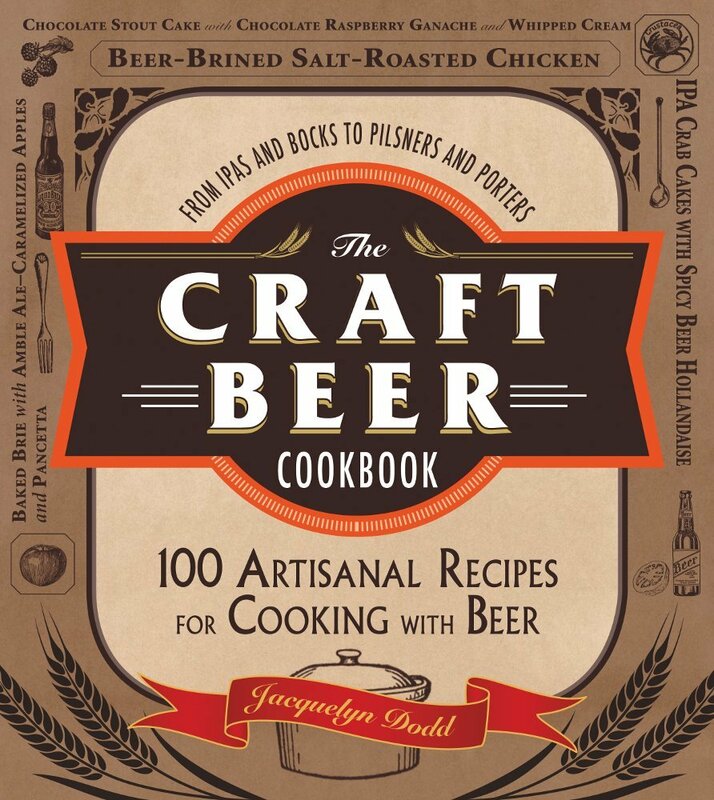 Definitely something to make when you want to impress your dinner company! Rustic elegance … and such a great flavor profile! 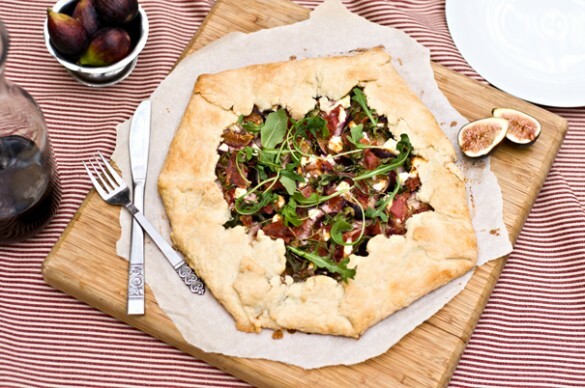 Love this galette! Look so delicious and the presentation is beautiful! Thanks for the recipe! I think I’m going to force myself to like figs, this looks great! Haha! I really didn’t like figs until this year. They are so pretty, I had to buy some and figure out how to use them. Now I love them. This galette makes a wonderful meal. I found your recipe several months ago and it has become a staple for me and my boyfriend. You inspired me to make galettes with all sorts of fillings (cheddar-onion-apple-maple marscapone was a hit) but I keep coming back to this one because its just so dreamy. Thanks!